Lois recalls the day the Daily Planet ran the "Is This Krypton?" story. She went up to the roof of the Planet to wait for Superman who never shows up. Superman's gone. Lois and Jimmy miss him. Lois is up on the roof having a cigarette when she's interrupted by a shadowy figure that turns out to be Richard White. He convinces her to write the story her way - and they begin to fall in love. Instead of writing a story about why the world needs Superman, she surprises Perry with a story titled "Why the World Doesn't Need Superman." Story - 4: This is a fun story. I just wish when Singer and Company conceived the story ideas, they'd shared certain character beats with the prequel writers. For instance, there's more to Lois Lane than what's presented here. If the idea of the prequel books is to put the first film into a sense of vague continuity, then use the dialogue that is most relevant to the film itself. One of the more important lines of dialogue from "Superman: The Movie" in terms of "Superman Returns" is "I certainly hope this little incident hasn't put you off flying, Miss. Statistically speaking, of course, it's still the safest way to travel." That line is paraphrased in the new movie and it'd have been nice for those who hadn't seen 1978's "Superman" in some time (or ever - and if you haven't ever seen it, what are you waiting for?) 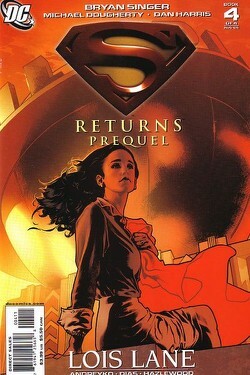 to get a refresher for what turns out to be pivotal dialogue in "Superman Returns". Art - 3: Richard White looks less like the actor who plays him and more like a young Earth-One Morgan Edge which is a bit creepy since the regular day-players are drawn to resemble their comic book selves. Cover Art - 3: Oh where, oh where has my underdog gone; oh where, oh where can he be? Sweet Lois pines for her dawg. The Daily Planet's the most well-read paper in Metropolis. Lois Lane the most well-red woman in Metropolis. Come on, like it didn't cross your mind too.